This past Monday we celebrated Presidents Day. 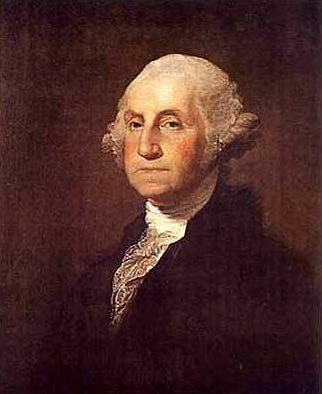 For many this is a day of car and furniture sales, but historically the holiday was to honor George Washington's birthday. In the later year's of American history, the holidaybecame a day to also honor Abraham Lincoln's birthday. In honoring these historic figures, we often forget that their influences went beyond government. In fact, George Washington was very influential in the development of many of the early American livestock breeds. Check out the breed profiles of the American Mammoth Jackstock, the Leicester Longwool sheep, and the Tunis sheep to learn how George Washington had a hand in developing these breeds in the United States. Each of these breeds is now on ALBC's Conservation Priority List, yet they've been here since the early days of our country. Shouldn't we preserve this history for future generations? If you watched the Super Bowl on Sunday, you probably saw the most recent Anheuser-Busch commercial referred to us "Clyesdale's friend." This heart-warming commercial featured a Clyesdale who befriends a calf (which appeared to be a Texas Longhorn). The commercial was light-hearted with a bit of humor and the imagery was great. According to USA Today, the commercial was ranked 4th in the group of Ten Most Popular Commercials. Anheuser-Busch is no stranger to Super Bowl commercials. The Clyesdales are always up to something new and often win the hearts of viewers around the country. But did you know the Clyesdale is an endangered breed with fewer than 2,500 registered animals remaining in the United States? Surprising huh? The Clydesdale is a draft horse breed from Lanarkshire, Scotland, and its name was inspired by the River Clyde. The Clydesdale’s history goes back to the mid-1700s, when native stocks were mated with larger Flemish horses and then -selected for use in agriculture and for all types of heavy hauling, including transport through the streets of Glasgow. Clydesdale horses were first exhibited under the breed name in 1826, and the breed was further standardized through the -system of hiring out purebred stallions. The Clydesdale Horse Society was formed in 1877, and its breed registry records go back to the 1830s. The Clydesdale was first imported to North America in the 1840s. The breed’s attractiveness and size led to its use in promotional hitches, such as one sponsored by the Chicago Stockyard Company. In the 1930s, the Anheuser Busch Company of St. Louis, Missouri, began to use a hitch of Clydesdales to celebrate the end of Prohibition and to represent the company’s products. The "Budweiser Clydesdales" were an immediate sensation when they delivered the first post-Prohibition beer to the White House, and the hitch has proven to be one of the most popular and successful advertising symbols of all time. 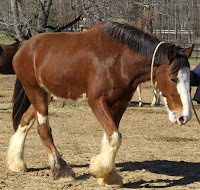 Less well known is the fact that Anheuser Busch has maintained a Clydesdale breeding program since 1953, and that the company’s commitment to the breed during the 1950s and 1960s was critical to its survival in North America. The Clydesdale combines strength and style. The breed's action is distinctive, with each foot lifted cleanly off the ground so that the bottom of the foot is visible from behind. The forelegs are well planted under the shoulders, the legs are straight, and the feet are durable. Clydesdales should have breadth between the eyes, with a flat facial profile and a wide muzzle. The withers are high, the back short, and the quarters long and well-muscled. The most common color is bay, though black, brown, chestnut, and roan are also seen. This year is off to a whirlwind start. ALBC staff members have been very busy with many exciting projects. Just last month we launched our first E-Newsletter. It's a great way to stay informed about ALBC happenings and rare breed news. We've also had many inquiries about the new ALBC Member Logo. It seems like members are enjoying the opportunity to show their support for the organization. Over the past few weeks, ALBC staffers have been busy finalizing the 2010 Conservation Priority List (CPL). This list is a critical part of our work and allows us to take a "snapshot" of a breed's population status at a given point in time. The updated listed will be published in the March/April 2010 ALBC News. ALBC often fields questions about the Conservation Priority List. Many people wonder how the list is compiled, what we count, how breeds get on the list, and more. Below is a question and answer series that help explain the procedures behind the CPL. How does ALBC determine a livestock breed’s status in the U.S.? ALBC monitors most mammalian livestock populations through their respective breed associations. Each year, ALBC requests registration data from breed associations. These data are indicators of active breeding populations in a given year. For standardized breeds of American origin, this may determine the breed’s conservation category. A few breeds do not have breed associations. These are mostly landraces. In these circumstances, ALBC works directly with breeders to understand their herds/flocks and estimate breeding populations. ALBC also tries to help breeders organize themselves to support conservation. Such organization often has as the valuable byproduct of easier access to population information. Why does ALBC only count registered animals? Registered animals are those with documented pedigrees. Assuming that registries are operated with integrity (an assumption we make), we know registered animals to be purebred. Generally, animals that are intended as breeding stock are registered and will contribute their genes to the next generation. Historically, unregistered animals had jobs other than breeding. Most breed associations for standardized breeds have no system for re-claiming presumed purebred animals that are not registered. Therefore, undocumented purebreds are both excluded and lost from the purebred population, as are any unique genes that individual animals might carry. This makes continuity of pedigree registration from generation to generation very important. While this approach results in an undercount to varying degrees, it does consistently count those animals most likely to contribute to the next purebred generation. How does ALBC determine the status or conservation category for each poultry breed? Poultry censusing is different than censusing for mammalian livestock. Poultry censusing requires a much more extensive approach to get a good picture. With poultry, ALBC contacts hatcheries, known major breeders, and ALBC members. ALBC also sends out surveys through the American Poultry Association, breed clubs, and the Society for the Preservation of Poultry Antiquities. ALBC advertises its poultry census in magazines and makes the survey available on the ALBC website for anyone and everyone. We try to reach as many people as possible. We also gather information from individuals. When ALBC performs a poultry census, what is counted? When ALBC collects poultry census information only breeding stock are counted. These are the birds that will contribute to the next generation. If an individual is keeping just one bird, or a few hens with no intention of breeding, these won't be included. How does ALBC determine global population numbers for poultry? ALBC's mission is genetic conservation so we monitor global populations. This information provides us with a context for international breeds. This is a softer number but is a valid indicator of global population. Global populations are estimated using data gathered by international conservation organizations including Rare Breeds Survival Trust, Rare Breeds Canada, Rare Breeds Australia, the Food and Agriculture Domestic Animal Diversity database (FAO DAD-IS), and similar organizations. ALBC also mines US and international publications to glean information about global population numbers. Additionally, ALBC staff communicates with colleagues and conservationists around the world to further explore international population numbers. Global data is much more difficult to obtain for poultry. ALBC draws on the FAO DAD-IS database and information from sister international conservation organizations. ALBC asks many questions of the global data: is the breed in the other countries the same breed as that found in the US? Is the data source reliable? Does the data make sense, based on what we know and we are able to learn from national and international colleagues? Answering each of these questions will lead us to a determination of endangered status. How is US and global information used? ALBC has developed parameters for inclusion of breeds on the Conservation Priority List. These parameters also guide our annual review of the breeds. ALBC seeks to put breed populations into a national and global context therefore ALBC uses both U.S. and global numbers in the annual review of its conservation priority list and to determine a breed’s status.